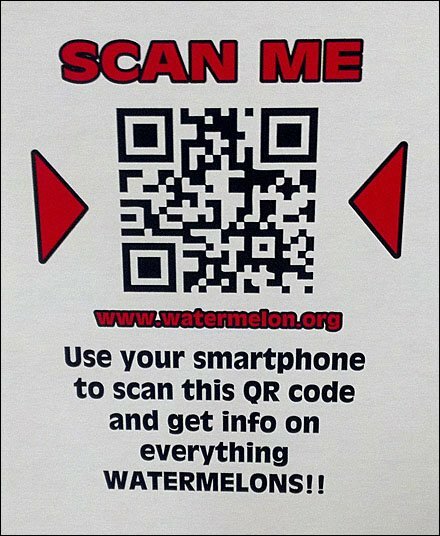 Watermelons by the pallet-load sport a QR Code to watermelon.org, for info on everything watermelon. But they are preaching to the choir. 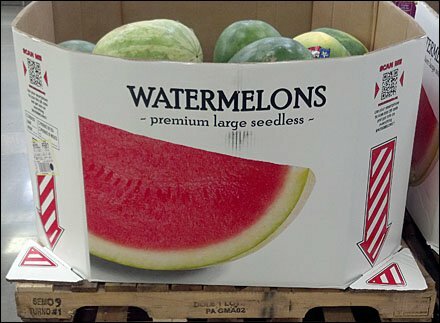 I has seen my wife buy 6 watermelons at a click, and can certify the event because it is me who gets to carry them from the basement garage upstairs to the kitchen. I have also seen her purchase what I estimate to be the equivalent of 60 services of cherries, strawberries, kiwi, oranges, and watermelon for only 2 of us for a week. If any of you represent the Fruit Marketing Board and need a cute spokesmodel, please think of my wife.